This is a really goofy Halloween video - watch Niki and Sammy attempt to make Halloween Cake Pops. Surely you can do better.. Anyhow, this is funny. And silly! Hybrid Moments By The Misfits Performed By Swamp Hedons. This is really bizarre! What does it mean? Does it portend of the end of reality? 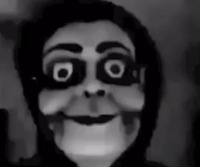 Is it some kind of weird Halloween internet scam video? Check it out. 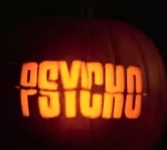 Watch the Pyscho Movie on a Pumpkin - "Psych-o-Lantern"
Alfred Hitchcock's Psycho: Pumpkin Stop Motion of the Shower Scene - Yuliya Tsukerman recreated the Hitchcock classic Psycho movie by etching a pumpkin. That's a lot of work. Check it out - very cool. The Firtiva video-on-demand website is officially going live on Halloween. To celebrate, watch scary Halloween movies including Night of the Living Dead, Attack of the Giant Leeches, The Brain That Wouldn't Die, and The Hunchback of Notre Dame. All for free. Rabble is a free social network that allows users to create and listen to audio tied to live sports and television events. Rabble enables everyone from passionate sports fans to reality-show junkies to deliver expert and witty commentary to their friends and followers. The platform is a first of its kind alternative to traditional broadcasts, pushing broadcast commentary beyond the tired and clichéd announcing crews and hosts. White Cops & Unarmed Black Civilians Play Set - The classic children’s pastime Cowboys and Indians takes a troubling modern turn. Created by Funny & Die. Make sure your kids are up to date on the latest political play set.